Over the past decade, the emergence of platforms through which to broadly distribute any and all types of media has made video a major component of how businesses reach and engage consumers with products and services. Read further to learn how authors can use DIY video techniques to engage their readers. Video as a format can mean many things. In the broadest sense, a video is any series of moving images, but the iterations of video formats are virtually endless. Looking at the projects currently in the Penguin Random House Video team’s production queue, video is everything from a short, animated ad, to a speech recorded at an industry event, to a live social media broadcast, to a talking-head interview, to a full-blown book trailer, to a fun scripted skit, to a 4-second GIF (a short, looping video), and so on. 1) Audience: Who is the audience? What is the message for that audience? Is video the right medium for delivering that message? If so, what kind of video has the best chance of resonating? 2) Distribution: Assuming video is the right medium, what is the right way to get that video message in front of the audience? Is the audience on Facebook? Instagram? YouTube? 3) Resources: Are you comfortable on camera? Is there a budget for hiring someone to help make this video? Do you have a friend who can help at a reduced price? Do you have the time and tools to experiment with making a video yourself? Legend. Legend (Apple App Store and Google Play) is a fantastically user-friendly way to make simple, slick-looking, square-formatted animated text videos (and/or GIFs) on a smartphone. As an example, let’s say you wanted to create something to commemorate Anne Frank’s birthday, June 12. You could use Legend to create a video (the ideal format for Facebook/Instagram) or a GIF (the ideal format for Twitter or for inclusion in the body of an email) featuring a quote from Anne Frank. Simply insert the text of the quote in Legend and choose an animation template. Legend lets you play around with a variety of animation templates, change colors, and even upload an image as the background of your video. 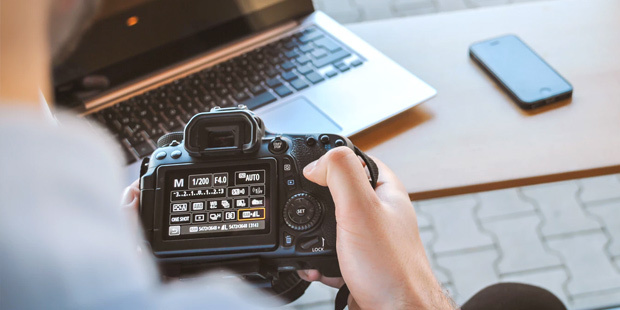 You should make sure that you have permission to use any photo that you did not take yourself, or that the photo is royalty-free (for instance, something in the public domain). You can find several other examples for this Anne Frank quote (both in video and GIF format) here. Once you are happy with the result, you can either export it to your phone’s photo library or post it directly to Instagram or other social media. 4) Once the GIF has been created, you can right click on it and “Save as…” to download (if you want to upload to Facebook, Twitter, or Instagram) or copy the link to share directly from Giphy. Videoshop. This app is for the do-it-yourselfer who wants something relatively easy but also wants to spend time customizing elements of a video. Videoshop (Apple App Store and Google Play) is one of the more comprehensive phone-based video editing tools on the market. The free version offers many standard video editing options – importing photos/videos, adding text and title cards—and some more advanced options, such as the ability to add stock music tracks as a soundtrack for your video. More advanced functions, like reverse, tilt shift, and the Ken Burns effect, are available if you purchase the “pro” version (which starts at $3.99/month). This app may not have the power/functionality of a Final Cut Pro or Adobe Premiere Pro on a laptop or desktop, but you’ll find it allows you to create very functional talking-head/live-action videos quickly. Ultimately, as with any marketing effort, you need to balance the work required with potential impact that work will have on your audience. Video can sometimes be a labor-intense endeavor, but the tools listed above are a few that help make it a bit easier to experiment. Start with what feels right for you and see how your audience reacts—if they respond well and, even better, if you have fun making the videos, the effort might very well be worth it! For more tips, check out the Facebook Mobile Studio website. John Clinton is Vice President and Director, Digital Video for Penguin Random House.